Now available from Silvan Australia , the new Selecta Fuel Cube is a simple diesel supply system to pump diesel from an onsite diesel storage tank into a tractor, vehicle or plant item. 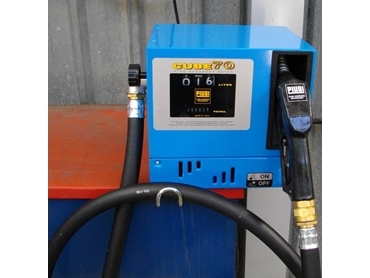 Manufactured by leading Italian diesel pump and equipment manufacturer, Piusi, the Selecta Fuel Cube is a mains powered vane pump and litreage meter kit, designed for permanent installation in the farm workshop or service bay. The Selecta Fuel Cube features a 240 volt self priming vane pump, designed for continuous running at an open flow capacity of 70 litres per minute. The pump includes an internal bypass which activates when the tank fills and the automatic shut-off gun activates. This bypass allows the pump to operate for a three minute period to avoid damage. The self priming vane pump and litreage kit is contained in a compact corrosion resistant metal assembly, designed to be fixed to a wall or similar structure. The Selecta Fuel Cube is supplied with a four metre length of diesel delivery hose, complete with an automatic nozzle gun with a swivel connection to avoid tangles. An on-off switch holster on the front of the Selecta Fuel Cube also automatically cuts off the pump when the hose and nozzle are replaced. Silvan Selecta spokesman Leigh O’Rielly says the Selecta Fuel Cube has a particular benefit for farmers and similar enterprises that are carefully managing their fuel inputs. “There has been a strong trend towards on farm or property storage of diesel in permanent storage tanks to obtain the maximum price benefits from bulk deliveries direct into storage,” says O’Rielly. The Selecta Fuel Cube provides the diesel supply system required for the transfer of the diesel from the stationary tank to the vehicle or equipment. With its compact size and dry weight of just 26kgs, the Selecta Fuel Cube can be fixed in an ideal position for ease of use and access.